Wednesday June 26 1907 Will and I took things out of the summer kitchen early he painted that and the front porch floor, put up the screen doors before dinner. I dressed a chicken soon after dinner and picked over and put up 4 qts of straw-berries Bily had picked in the morning. The boys started to plow corn in the afternoon. Will got the mail after supper. There was Lizzie Lindleys picture with the message she was coming in Aug or Sep and a letter from Lorna Mason saying her Aunt Jane and son were there and likely she and her [Mother?] 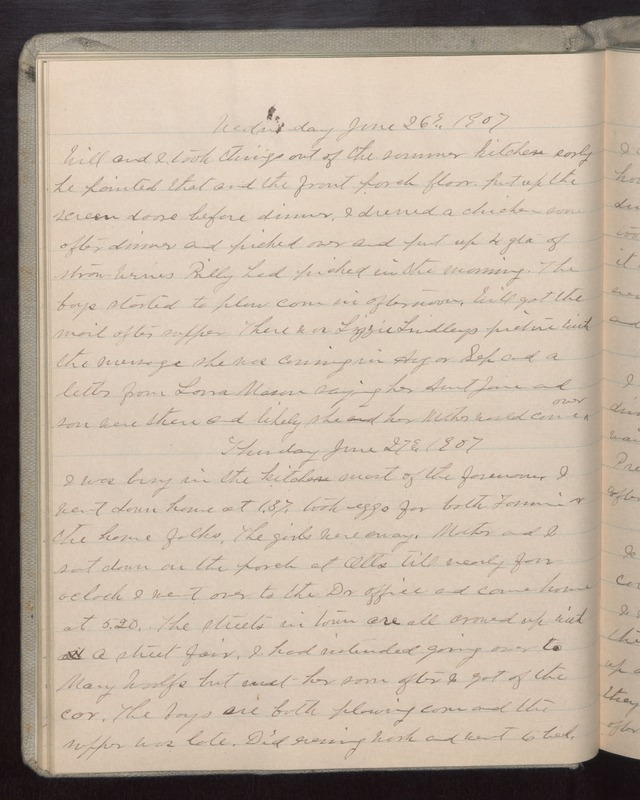 would come over Thursday June 27 1907 I was busy in the kitchen most of the forenoon I went down home at 1.37. took eggs for both Fannie & the home folks. The girls were away. Mother and I sat down on the porch at Otts till nearly four oclock I went over to the Dr office and came home at 5.20. The streets in town are all [illegible] up with a street fair. I had intended going over to Mary Woolfs but [illegible] her [illegible] after I got of the car. The boys are both plowing corn and the supper was late. Did evening work and went to bed.